MIAMI, FL--(Marketwire - October 13, 2010) - Terra Music Fest, an integrated digital experience developed as part of the Live and Loud platform culminated in a day-long concert headlined by Nelly Furtado, Don Omar, Fefe Dobson and Belanova in Los Angeles. The "Live On-demand" concert experience will be expanded nationally when the concert premieres online this Thursday at 2:00PM EDT. The global digital media company and bilingual content producer partnered with Ford Motor Company to integrate the Ford brand with a fully immersive online and offline experience, including product integration and interaction, as well as a fully supported promotional campaign employing both brands. Terra Music Fest offered its audience both concourse and amphitheater performances, beginning with an outside performance by new Latin rock artist Gustavo Galindo followed by the Latin hip-hop duo Akwid. Inside the amphitheater, Pop singer Fefe Dobson put on an energetic performance that had the crowd on their feet and Latin Grammy winners Belanova performed their most popular songs. Nelly Furtado had fans singing along to her Spanish and English hits, and the concert ended with a show stopping performance by Don Omar, who had everyone in the amphitheater going wild. "We are thrilled with the success of Terra Music Fest. It is gratifying to be able to provide our audience not only an online music experience, but also offer it live," said Fernando Rodriguez, CEO of Terra USA. "Our ultimate goal is to give our audience what they enjoy and prefer and Terra Music Fest is just one of the many efforts that Terra is undertaking," added Rodriguez. The Live and Loud Music platform exposed Terra's 3.5 million monthly unique users to the most comprehensive "digital concert-going" experience that will peak with the "Terra Music Fest Live On-demand" show this Thursday. A pre-concert event will be hosted at the Terra studios in Miami, in anticipation of the on-demand concert, where fans will talk about the best moments of the show and entertainment experts and editors will reveal everything that took place behind the scenes. 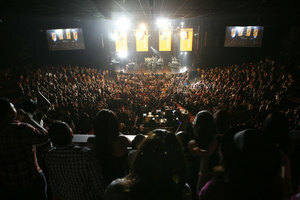 A sweepstakes will be underway where fans must answer questions about the concert in order to win. After its initial launch, the concert will be available for users to enjoy over and over "on-demand." Terra Music Fest was presented by Ford. As partners, Terra & Ford celebrated music and Hispanic Heritage Month with over five thousand attendees. Fans not only got to listen and dance to their favorite performers but also got an exclusive look at Ford's unique display of vehicles that surrounded the Gibson Amphitheater. "We are excited to have presented the 1st annual Terra Music Fest, providing our young Hispanic consumers access to the hottest artists and the latest Ford vehicles and Technologies," said Dave Rodriguez, Ford Motor Company, Multicultural Marketing Manager. Terra (www.terra.com) is a global digital media company and bilingual content producer with a presence in 18 countries, including the United States where it serves the growing Hispanic community. Focusing on lifestyle, entertainment, sports and news, Terra creates an interactive user experience for millions of U.S. Hispanics and provides solutions for advertisers seeking exposure among this key demographic. In Latin America, Terra is the region's leading Internet company, with 70 million unique visitors per month.